The symbol for a battery in a circuit diagram. It originated as a schematic drawing of the earliest type of battery, a voltaic pile. Primary (single-use or "disposable") batteries are used once and discarded; the electrode materials are irreversibly changed during discharge. Common examples are the alkaline battery used for flashlights and a multitude of portable electronic devices. Secondary (rechargeable) batteries can be discharged and recharged multiple times using an applied electric current; the original composition of the electrodes can be restored by reverse current. Examples include the lead-acid batteries used in vehicles and lithium-ion batteries used for portable electronics such as laptops and smartphones. The usage of "battery" to describe a group of electrical devices dates to Benjamin Franklin, who in 1748 described multiple Leyden jars by analogy to a battery of cannon (Benjamin Franklin borrowed the term "battery" from the military, which refers to weapons functioning together). Italian physicist Alessandro Volta built and described the first electrochemical battery, the voltaic pile, in 1800. This was a stack of copper and zinc plates, separated by brine-soaked paper disks, that could produce a steady current for a considerable length of time. Volta did not understand that the voltage was due to chemical reactions. He thought that his cells were an inexhaustible source of energy, and that the associated corrosion effects at the electrodes were a mere nuisance, rather than an unavoidable consequence of their operation, as Michael Faraday showed in 1834. Although early batteries were of great value for experimental purposes, in practice their voltages fluctuated and they could not provide a large current for a sustained period. The Daniell cell, invented in 1836 by British chemist John Frederic Daniell, was the first practical source of electricity, becoming an industry standard and seeing widespread adoption as a power source for electrical telegraph networks. It consisted of a copper pot filled with a copper sulfate solution, in which was immersed an unglazed earthenware container filled with sulfuric acid and a zinc electrode. These wet cells used liquid electrolytes, which were prone to leakage and spillage if not handled correctly. Many used glass jars to hold their components, which made them fragile and potentially dangerous. These characteristics made wet cells unsuitable for portable appliances. Near the end of the nineteenth century, the invention of dry cell batteries, which replaced the liquid electrolyte with a paste, made portable electrical devices practical. A voltaic cell for demonstration purposes. In this example the two half-cells are linked by a salt bridge that permits the transfer of ions. Batteries convert chemical energy directly to electrical energy. In many cases, the electrical energy released is the difference in the cohesive  or bond energies of the metals, oxides, or molecules undergoing the electrochemical reaction. For instance, energy can be stored in Zn or Li, which are high-energy metals because they are not stabilized by d-electron bonding, unlike transition metals. Batteries are designed such that the energetically favorable redox reaction can occur only if electrons move through the external part of the circuit. A battery consists of some number of voltaic cells. Each cell consists of two half-cells connected in series by a conductive electrolyte containing metal cations. One half-cell includes electrolyte and the negative electrode, the electrode to which anions (negatively charged ions) migrate; the other half-cell includes electrolyte and the positive electrode, to which cations (positively charged ions) migrate. Cations are reduced (electrons are added) at the cathode, while metal atoms are oxidized (electrons are removed) at the anode. Some cells use different electrolytes for each half-cell; then a separator is used to prevent mixing of the electrolytes while allowing ions to flow between half-cells to complete the electrical circuit. ; in other words, the net emf is the difference between the reduction potentials of the half-reactions. until exhausted, then dropping to zero. If such a cell maintained 1.5 volts and produce a charge of one coulomb then on complete discharge it would have performed 1.5 joules of work. In actual cells, the internal resistance increases under discharge and the open-circuit voltage also decreases under discharge. If the voltage and resistance are plotted against time, the resulting graphs typically are a curve; the shape of the curve varies according to the chemistry and internal arrangement employed. The voltage developed across a cell's terminals depends on the energy release of the chemical reactions of its electrodes and electrolyte. Alkaline and zinc–carbon cells have different chemistries, but approximately the same emf of 1.5 volts; likewise NiCd and NiMH cells have different chemistries, but approximately the same emf of 1.2 volts. The high electrochemical potential changes in the reactions of lithium compounds give lithium cells emfs of 3 volts or more. Primary batteries are designed to be used until exhausted of energy then discarded. Their chemical reactions are generally not reversible, so they cannot be recharged. When the supply of reactants in the battery is exhausted, the battery stops producing current and is useless. Secondary batteries can be recharged; that is, they can have their chemical reactions reversed by applying electric current to the cell. This regenerates the original chemical reactants, so they can be used, recharged, and used again multiple times. Primary batteries, or primary cells, can produce current immediately on assembly. These are most commonly used in portable devices that have low current drain, are used only intermittently, or are used well away from an alternative power source, such as in alarm and communication circuits where other electric power is only intermittently available. Disposable primary cells cannot be reliably recharged, since the chemical reactions are not easily reversible and active materials may not return to their original forms. Battery manufacturers recommend against attempting to recharge primary cells. In general, these have higher energy densities than rechargeable batteries, but disposable batteries do not fare well under high-drain applications with loads under 75 ohms (75 Ω). Common types of disposable batteries include zinc–carbon batteries and alkaline batteries. Secondary batteries, also known as secondary cells, or rechargeable batteries, must be charged before first use; they are usually assembled with active materials in the discharged state. Rechargeable batteries are (re)charged by applying electric current, which reverses the chemical reactions that occur during discharge/use. Devices to supply the appropriate current are called chargers. The oldest form of rechargeable battery is the lead–acid battery, which are widely used in automotive and boating applications. This technology contains liquid electrolyte in an unsealed container, requiring that the battery be kept upright and the area be well ventilated to ensure safe dispersal of the hydrogen gas it produces during overcharging. The lead–acid battery is relatively heavy for the amount of electrical energy it can supply. Its low manufacturing cost and its high surge current levels make it common where its capacity (over approximately 10 Ah) is more important than weight and handling issues. A common application is the modern car battery, which can, in general, deliver a peak current of 450 amperes. Gel batteries (or "gel cell") use a semi-solid electrolyte. Other portable rechargeable batteries include several sealed "dry cell" types, that are useful in applications such as mobile phones and laptop computers. Cells of this type (in order of increasing power density and cost) include nickel–cadmium (NiCd), nickel–zinc (NiZn), nickel metal hydride (NiMH), and lithium-ion (Li-ion) cells. Li-ion has by far the highest share of the dry cell rechargeable market. NiMH has replaced NiCd in most applications due to its higher capacity, but NiCd remains in use in power tools, two-way radios, and medical equipment. In the 2000s, developments include batteries with embedded electronics such as USBCELL, which allows charging an AA battery through a USB connector, nanoball batteries that allow for a discharge rate about 100x greater than current batteries, and smart battery packs with state-of-charge monitors and battery protection circuits that prevent damage on over-discharge. Low self-discharge (LSD) allows secondary cells to be charged prior to shipping. Many types of electrochemical cells have been produced, with varying chemical processes and designs, including galvanic cells, electrolytic cells, fuel cells, flow cells and voltaic piles. A wet cell battery has a liquid electrolyte. Other names are flooded cell, since the liquid covers all internal parts, or vented cell, since gases produced during operation can escape to the air. Wet cells were a precursor to dry cells and are commonly used as a learning tool for electrochemistry. They can be built with common laboratory supplies, such as beakers, for demonstrations of how electrochemical cells work. A particular type of wet cell known as a concentration cell is important in understanding corrosion. Wet cells may be primary cells (non-rechargeable) or secondary cells (rechargeable). Originally, all practical primary batteries such as the Daniell cell were built as open-top glass jar wet cells. Other primary wet cells are the Leclanche cell, Grove cell, Bunsen cell, Chromic acid cell, Clark cell, and Weston cell. The Leclanche cell chemistry was adapted to the first dry cells. Wet cells are still used in automobile batteries and in industry for standby power for switchgear, telecommunication or large uninterruptible power supplies, but in many places batteries with gel cells have been used instead. These applications commonly use lead–acid or nickel–cadmium cells. A dry cell uses a paste electrolyte, with only enough moisture to allow current to flow. Unlike a wet cell, a dry cell can operate in any orientation without spilling, as it contains no free liquid, making it suitable for portable equipment. By comparison, the first wet cells were typically fragile glass containers with lead rods hanging from the open top and needed careful handling to avoid spillage. Lead–acid batteries did not achieve the safety and portability of the dry cell until the development of the gel battery. A common dry cell is the zinc–carbon battery, sometimes called the dry Leclanché cell, with a nominal voltage of 1.5 volts, the same as the alkaline battery (since both use the same zinc–manganese dioxide combination). A standard dry cell comprises a zinc anode, usually in the form of a cylindrical pot, with a carbon cathode in the form of a central rod. The electrolyte is ammonium chloride in the form of a paste next to the zinc anode. The remaining space between the electrolyte and carbon cathode is taken up by a second paste consisting of ammonium chloride and manganese dioxide, the latter acting as a depolariser. In some designs, the ammonium chloride is replaced by zinc chloride. Molten salt batteries are primary or secondary batteries that use a molten salt as electrolyte. They operate at high temperatures and must be well insulated to retain heat. A reserve battery can be stored unassembled (unactivated and supplying no power) for a long period (perhaps years). When the battery is needed, then it is assembled (e.g., by adding electrolyte); once assembled, the battery is charged and ready to work. For example, a battery for an electronic artillery fuze might be activated by the impact of firing a gun. The acceleration breaks a capsule of electrolyte that activates the battery and powers the fuze's circuits. Reserve batteries are usually designed for a short service life (seconds or minutes) after long storage (years). A water-activated battery for oceanographic instruments or military applications becomes activated on immersion in water. A battery's characteristics may vary over load cycle, over charge cycle, and over lifetime due to many factors including internal chemistry, current drain, and temperature. At low temperatures, a battery cannot deliver as much power. As such, in cold climates, some car owners install battery warmers, which are small electric heating pads that keep the car battery warm. A battery's capacity is the amount of electric charge it can deliver at the rated voltage. The more electrode material contained in the cell the greater its capacity. A small cell has less capacity than a larger cell with the same chemistry, although they develop the same open-circuit voltage. Capacity is measured in units such as amp-hour (A·h). The rated capacity of a battery is usually expressed as the product of 20 hours multiplied by the current that a new battery can consistently supply for 20 hours at 68 °F (20 °C), while remaining above a specified terminal voltage per cell. For example, a battery rated at 100 A·h can deliver 5 A over a 20-hour period at room temperature. The fraction of the stored charge that a battery can deliver depends on multiple factors, including battery chemistry, the rate at which the charge is delivered (current), the required terminal voltage, the storage period, ambient temperature and other factors. is the capacity when discharged at a rate of 1 amp. is the current drawn from battery (A). is the amount of time (in hours) that a battery can sustain. is a constant around 1.3. Batteries that are stored for a long period or that are discharged at a small fraction of the capacity lose capacity due to the presence of generally irreversible side reactions that consume charge carriers without producing current. This phenomenon is known as internal self-discharge. Further, when batteries are recharged, additional side reactions can occur, reducing capacity for subsequent discharges. After enough recharges, in essence all capacity is lost and the battery stops producing power. Internal energy losses and limitations on the rate that ions pass through the electrolyte cause battery efficiency to vary. Above a minimum threshold, discharging at a low rate delivers more of the battery's capacity than at a higher rate. Installing batteries with varying A·h ratings does not affect device operation (although it may affect the operation interval) rated for a specific voltage unless load limits are exceeded. High-drain loads such as digital cameras can reduce total capacity, as happens with alkaline batteries. For example, a battery rated at 2 A·h for a 10- or 20-hour discharge would not sustain a current of 1 A for a full two hours as its stated capacity implies. The C-rate is a measure of the rate at which a battery is being charged or discharged. It is defined as the current through the battery divided by the theoretical current draw under which the battery would deliver its nominal rated capacity in one hour. It has the units h−1. C-rate is used as a rating on batteries to indicate the maximum current that a battery can safely deliver on a circuit. Standards for rechargeable batteries generally rate the capacity over a 4-hour, 8 hour or longer discharge time. Types intended for special purposes, such as in a computer uninterruptible power supply, may be rated by manufacturers for discharge periods much less than one hour. Because of internal resistance loss and the chemical processes inside the cells, a battery rarely delivers nameplate rated capacity in only one hour. 4) battery technology was the fastest-charging/discharging, fully discharging in 10–20 seconds. As of 2017[update], the world's largest battery was built in South Australia by Tesla. It can store 129 MWh. A battery in Hebei Province, China which can store 36 MWh of electricity was built in 2013 at a cost of $500 million. Another large battery, composed of Ni–Cd cells, was in Fairbanks, Alaska. It covered 2,000 square metres (22,000 sq ft)—bigger than a football pitch—and weighed 1,300 tonnes. It was manufactured by ABB to provide backup power in the event of a blackout. The battery can provide 40 MW of power for up to seven minutes. Sodium–sulfur batteries have been used to store wind power. A 4.4 MWh battery system that can deliver 11 MW for 25 minutes stabilizes the output of the Auwahi wind farm in Hawaii. Lithium–sulfur batteries were used on the longest and highest solar-powered flight. Battery life (and its synonym battery lifetime) has two meanings for rechargeable batteries but only one for non-chargeables. For rechargeables, it can mean either the length of time a device can run on a fully charged battery or the number of charge/discharge cycles possible before the cells fail to operate satisfactorily. For a non-rechargeable these two lives are equal since the cells last for only one cycle by definition. (The term shelf life is used to describe how long a battery will retain its performance between manufacture and use.) Available capacity of all batteries drops with decreasing temperature. In contrast to most of today's batteries, the Zamboni pile, invented in 1812, offers a very long service life without refurbishment or recharge, although it supplies current only in the nanoamp range. The Oxford Electric Bell has been ringing almost continuously since 1840 on its original pair of batteries, thought to be Zamboni piles. Disposable batteries typically lose 8 to 20 percent of their original charge per year when stored at room temperature (20–30 °C). This is known as the "self-discharge" rate, and is due to non-current-producing "side" chemical reactions that occur within the cell even when no load is applied. The rate of side reactions is reduced for batteries stored at lower temperatures, although some can be damaged by freezing. Old rechargeable batteries self-discharge more rapidly than disposable alkaline batteries, especially nickel-based batteries; a freshly charged nickel cadmium (NiCd) battery loses 10% of its charge in the first 24 hours, and thereafter discharges at a rate of about 10% a month. However, newer low self-discharge nickel metal hydride (NiMH) batteries and modern lithium designs display a lower self-discharge rate (but still higher than for primary batteries). Internal parts may corrode and fail, or the active materials may be slowly converted to inactive forms. The active material on the battery plates changes chemical composition on each charge and discharge cycle; active material may be lost due to physical changes of volume, further limiting the number of times the battery can be recharged. Most nickel-based batteries are partially discharged when purchased, and must be charged before first use. Newer NiMH batteries are ready to be used when purchased, and have only 15% discharge in a year. Some deterioration occurs on each charge–discharge cycle. Degradation usually occurs because electrolyte migrates away from the electrodes or because active material detaches from the electrodes. Low-capacity NiMH batteries (1,700–2,000 mA·h) can be charged some 1,000 times, whereas high-capacity NiMH batteries (above 2,500 mA·h) last about 500 cycles. NiCd batteries tend to be rated for 1,000 cycles before their internal resistance permanently increases beyond usable values. Fast charging increases component changes, shortening battery lifespan. If a charger cannot detect when the battery is fully charged then overcharging is likely, damaging it. NiCd cells, if used in a particular repetitive manner, may show a decrease in capacity called "memory effect". The effect can be avoided with simple practices. NiMH cells, although similar in chemistry, suffer less from memory effect. Automotive lead–acid rechargeable batteries must endure stress due to vibration, shock, and temperature range. Because of these stresses and sulfation of their lead plates, few automotive batteries last beyond six years of regular use. Automotive starting (SLI: Starting, Lighting, Ignition) batteries have many thin plates to maximize current. In general, the thicker the plates the longer the life. They are typically discharged only slightly before recharge. "Deep-cycle" lead–acid batteries such as those used in electric golf carts have much thicker plates to extend longevity. The main benefit of the lead–acid battery is its low cost; its main drawbacks are large size and weight for a given capacity and voltage. Lead–acid batteries should never be discharged to below 20% of their capacity, because internal resistance will cause heat and damage when they are recharged. Deep-cycle lead–acid systems often use a low-charge warning light or a low-charge power cut-off switch to prevent the type of damage that will shorten the battery's life. Battery life can be extended by storing the batteries at a low temperature, as in a refrigerator or freezer, which slows the side reactions. Such storage can extend the life of alkaline batteries by about 5%; rechargeable batteries can hold their charge much longer, depending upon type. To reach their maximum voltage, batteries must be returned to room temperature; discharging an alkaline battery at 250 mA at 0 °C is only half as efficient as at 20 °C. Alkaline battery manufacturers such as Duracell do not recommend refrigerating batteries. Primary batteries readily available to consumers range from tiny button cells used for electric watches, to the No. 6 cell used for signal circuits or other long duration applications. Secondary cells are made in very large sizes; very large batteries can power a submarine or stabilize an electrical grid and help level out peak loads. A battery explosion is generally caused by misuse or malfunction, such as attempting to recharge a primary (non-rechargeable) battery, or a short circuit. When a battery is recharged at an excessive rate, an explosive gas mixture of hydrogen and oxygen may be produced faster than it can escape from within the battery (e.g. through a built-in vent), leading to pressure build-up and eventual bursting of the battery case. In extreme cases, battery chemicals may spray violently from the casing and cause injury. Overcharging – that is, attempting to charge a battery beyond its electrical capacity – can also lead to a battery explosion, in addition to leakage or irreversible damage. It may also cause damage to the charger or device in which the overcharged battery is later used. Car batteries are most likely to explode when a short-circuit generates very large currents. Such batteries produce hydrogen, which is very explosive, when they are overcharged (because of electrolysis of the water in the electrolyte). During normal use, the amount of overcharging is usually very small and generates little hydrogen, which dissipates quickly. However, when "jump starting" a car, the high current can cause the rapid release of large volumes of hydrogen, which can be ignited explosively by a nearby spark, e.g. when disconnecting a jumper cable. Disposing of a battery via incineration may cause an explosion as steam builds up within the sealed case. Recalls of devices using Lithium-ion batteries have become more common in recent years. This is in response to reported accidents and failures, occasionally ignition or explosion. An expert summary of the problem indicates that this type uses "liquid electrolytes to transport lithium ions between the anode and the cathode. If a battery cell is charged too quickly, it can cause a short circuit, leading to explosions and fires". Many battery chemicals are corrosive, poisonous or both. If leakage occurs, either spontaneously or through accident, the chemicals released may be dangerous. For example, disposable batteries often use a zinc "can" both as a reactant and as the container to hold the other reagents. If this kind of battery is over-discharged, the reagents can emerge through the cardboard and plastic that form the remainder of the container. The active chemical leakage can then damage or disable the equipment that the batteries power. For this reason, many electronic device manufacturers recommend removing the batteries from devices that will not be used for extended periods of time. Many types of batteries employ toxic materials such as lead, mercury, and cadmium as an electrode or electrolyte. When each battery reaches end of life it must be disposed of to prevent environmental damage. Batteries are one form of electronic waste (e-waste). E-waste recycling services recover toxic substances, which can then be used for new batteries. Of the nearly three billion batteries purchased annually in the United States, about 179,000 tons end up in landfills across the country. 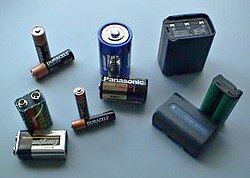 In the United States, the Mercury-Containing and Rechargeable Battery Management Act of 1996 banned the sale of mercury-containing batteries, enacted uniform labeling requirements for rechargeable batteries and required that rechargeable batteries be easily removable. California and New York City prohibit the disposal of rechargeable batteries in solid waste, and along with Maine require recycling of cell phones. The rechargeable battery industry operates nationwide recycling programs in the United States and Canada, with dropoff points at local retailers. The Battery Directive of the European Union has similar requirements, in addition to requiring increased recycling of batteries and promoting research on improved battery recycling methods. In accordance with this directive all batteries to be sold within the EU must be marked with the "collection symbol" (a crossed-out wheeled bin). This must cover at least 3% of the surface of prismatic batteries and 1.5% of the surface of cylindrical batteries. All packaging must be marked likewise. Batteries may be harmful or fatal if swallowed. Small button cells can be swallowed, in particular by young children. While in the digestive tract, the battery's electrical discharge may lead to tissue damage; such damage is occasionally serious and can lead to death. Ingested disk batteries do not usually cause problems unless they become lodged in the gastrointestinal tract. The most common place for disk batteries to become lodged is the esophagus, resulting in clinical sequelae. Batteries that successfully traverse the esophagus are unlikely to lodge elsewhere. The likelihood that a disk battery will lodge in the esophagus is a function of the patient's age and battery size. Disk batteries of 16 mm have become lodged in the esophagi of 2 children younger than 1 year. Older children do not have problems with batteries smaller than 21–23 mm. 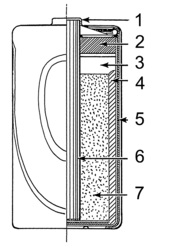 Liquefaction necrosis may occur because sodium hydroxide is generated by the current produced by the battery (usually at the anode). Perforation has occurred as rapidly as 6 hours after ingestion. Many important cell properties, such as voltage, energy density, flammability, available cell constructions, operating temperature range and shelf life, are dictated by battery chemistry. Zinc–chloride 1.5 Also known as "heavy-duty", inexpensive. (zinc–manganese dioxide) Zn MnO2 1.5 1.15 0.4–0.59 Moderate energy density. (zinc–manganese dioxide/nickel oxyhydroxide) 1.7 Moderate energy density. Good for high drain uses. Li–CuO Li CuO 1.7 No longer manufactured. Replaced by silver oxide (IEC-type "SR") batteries. LiFeS2 Li FeS2 1.8 1.5 1.07 Expensive. LiMnO2 Li MnO2 3.0 0.83–1.01 Expensive. Used only in high-drain devices or for long shelf-life due to very low rate of self-discharge. 'Lithium' alone usually refers to this type of chemistry. Mercury oxide Zn HgO 1.34 1.2 High-drain and constant voltage. Zinc–air Zn O2 1.6 1.1 1.59 Used mostly in hearing aids. Silver-oxide (silver–zinc) Zn Ag2O 1.85 1.5 0.47 Very expensive. NiCd 1.2 140 Nickel–cadmium chemistry. Can withstand very high discharge rates with virtually no loss of capacity. Environmental hazard due to Cadmium – use now virtually prohibited in Europe. Lead–acid 2.1 140 Moderately expensive. Higher discharge rates result in considerable loss of capacity. Environmental hazard due to Lead. NiMH 1.2 360 Nickel–metal hydride chemistry. Performs better than alkaline batteries in higher drain devices. Traditional chemistry has high energy density, but also a high rate of self-discharge. Newer chemistry has low self-discharge rate, but also a ~25% lower energy density. NiZn 1.6 360 Nickel-zinc chemistry. Voltage closer to alkaline primary cells than other secondary cells. Newly introduced to the market (2009). Has not yet established a track record. Smaller volume than equivalent Li-ion. Extremely expensive due to silver. For many years considered obsolete due to high silver prices. Cell suffers from oxidation if unused. Reactions are not fully understood. due to presence of both argentous and argentic oxide in positive plate – one is consumed first). Has been used in lieu of primary battery (moon buggy). Is being developed once again as a replacement for Li-ion. 3.0 360 790 Lithium-Iron-Phosphate chemistry. Lithium ion 3.6 460 Various lithium chemistries. Not usually available in "common" battery sizes. 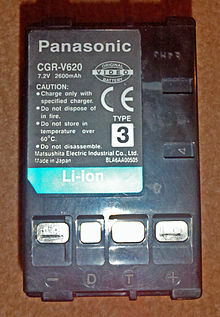 Lithium polymer battery is common in laptop computers, digital cameras, camcorders, and cellphones. Very low rate of self-discharge. Terminal voltage varies from 4.2 to 3.0 volts during discharge. Volatile: Chance of explosion if short-circuited, allowed to overheat, or not manufactured with rigorous quality standards. On 28 February 2017, The University of Texas at Austin issued a press release about a new type of solid-state battery, developed by a team led by Lithium-ion (Li-Ion) inventor John Goodenough, "that could lead to safer, faster-charging, longer-lasting rechargeable batteries for handheld mobile devices, electric cars and stationary energy storage". More specifics about the new technology were published in the peer-reviewed scientific journal Energy & Environmental Science. Independent reviews of the technology discuss the risk of fire and explosion from Lithium-ion batteries under certain conditions because they use liquid electrolytes. The newly developed battery should be safer since it uses glass electrolytes, that should eliminate short circuits. The solid-state battery is also said to have "three times the energy density" increasing its useful life in electric vehicles, for example. It should also be more ecologically sound since the technology uses less expensive, earth-friendly materials such as sodium extracted from seawater. They also have much longer life; ("the cells have demonstrated more than 1,200 cycles with low cell resistance"). The research and prototypes are not expected to lead to a commercially viable product in the near future, if ever, according to Chris Robinson of LUX Research. "This will have no tangible effect on electric vehicle adoption in the next 15 years, if it does at all. A key hurdle that many solid-state electrolytes face is lack of a scalable and cost-effective manufacturing process," he told The American Energy News in an e-mail. 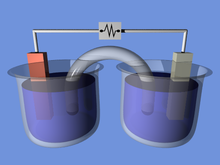 Almost any liquid or moist object that has enough ions to be electrically conductive can serve as the electrolyte for a cell. As a novelty or science demonstration, it is possible to insert two electrodes made of different metals into a lemon, potato, etc. and generate small amounts of electricity. "Two-potato clocks" are also widely available in hobby and toy stores; they consist of a pair of cells, each consisting of a potato (lemon, et cetera) with two electrodes inserted into it, wired in series to form a battery with enough voltage to power a digital clock. Homemade cells of this kind are of no practical use. A voltaic pile can be made from two coins (such as a nickel and a penny) and a piece of paper towel dipped in salt water. Such a pile generates a very low voltage but, when many are stacked in series, they can replace normal batteries for a short time. Sony has developed a biological battery that generates electricity from sugar in a way that is similar to the processes observed in living organisms. The battery generates electricity through the use of enzymes that break down carbohydrates. Lead acid cells can easily be manufactured at home, but a tedious charge/discharge cycle is needed to 'form' the plates. This is a process in which lead sulfate forms on the plates, and during charge is converted to lead dioxide (positive plate) and pure lead (negative plate). Repeating this process results in a microscopically rough surface, increasing the surface area, increasing the current the cell can deliver. Daniell cells are easy to make at home. Aluminium–air batteries can be produced with high-purity aluminium. Aluminium foil batteries will produce some electricity, but are not efficient, in part because a significant amount of (combustible) hydrogen gas is produced. ^ Crompton, T.R. (2000-03-20). Battery Reference Book (third ed.). Newnes. p. Glossary 3. ISBN 978-0-08-049995-6. Retrieved 2016-03-18. ^ Pauling, Linus (1988). "15: Oxidation-Reduction Reactions; Electrolysis.". General Chemistry. New York: Dover Publications, Inc. p. 539. ISBN 978-0-486-65622-9. ^ a b Schmidt-Rohr, Klaus (2018). "How Batteries Store and Release Energy: Explaining Basic Electrochemistry". Journal of Chemical Education. 95 (10): 1801–1810. Bibcode:2018JChEd..95.1801S. doi:10.1021/acs.jchemed.8b00479. ^ Pistoia, Gianfranco (2005-01-25). Batteries for Portable Devices. Elsevier. p. 1. ISBN 978-0-08-045556-3. Retrieved 2016-03-18. ^ Power Shift: DFJ on the lookout for more power source investments Archived 1 December 2005 at the Wayback Machine.Draper Fisher Jurvetson. Retrieved 20 November 2005. ^ Bellis, Mary. History of the Electric Battery. About.com. Retrieved 11 August 2008. ^ National Geographic Society. "Quiz: What You Don't Know About Batteries". National Geographic. ^ Bellis, Mary. Biography of Alessandro Volta – Stored Electricity and the First Battery. About.com. Retrieved 7 August 2008. ^ Stinner, Arthur. Alessandro Volta and Luigi Galvani Archived 10 September 2008 at the Wayback Machine (PDF). Retrieved 11 August 2008. ^ Electric Battery History – Invention of the Electric Battery. The Great Idea Finder. Retrieved 11 August 2008. ^ Battery History, Technology, Applications and Development. MPower Solutions Ltd. Retrieved 19 March 2007. ^ Borvon, Gérard (10 September 2012). "History of the electrical units". Association S-EAU-S.
^ "Columbia Dry Cell Battery". National Historic Chemical Landmarks. American Chemical Society. Archived from the original on 23 February 2013. Retrieved 25 March 2013. ^ Ashcroft, N.W. ; Mermin (1976). Solid State Physics. N.D. Belmont, CA: Brooks/Cole. ^ Terminal Voltage – Tiscali Reference Archived 11 April 2008 at the Wayback Machine. Originally from Hutchinson Encyclopaedia. Retrieved 7 April 2007. ^ a b Duracell: Battery Care. Retrieved 10 August 2008. ^ a b Alkaline Manganese Dioxide Handbook and Application Manual (PDF). Energizer. Retrieved 25 August 2008. ^ Dynasty VRLA Batteries and Their Application Archived 6 February 2009 at the Wayback Machine. C&D Technologies, Inc. Retrieved 26 August 2008. ^ USBCELL – Revolutionary rechargeable USB battery that can charge from any USB port. Retrieved 6 November 2007. ^ "Spotlight on Photovoltaics & Fuel Cells: A Web-based Study & Comparison" (PDF). pp. 1–2. Retrieved 14 March 2007. ^ "Elon Musk wins $50m bet with giant battery for South Australia". Sky News. 24 November 2017. Retrieved 20 September 2018. ^ Dillow, Clay (21 December 2012). "China Builds the World's Largest Battery, a Building-Sized, 36-Megawatt-Hour Behemoth | Popular Science". Popsci.com. Retrieved 31 July 2013. ^ "Auwahi Wind | Energy Solutions | Sempra U.S. Gas & Power, LLC". Semprausgp.com. Retrieved 31 July 2013. ^ Self discharge of batteries – Corrosion Doctors. Retrieved 9 September 2007. ^ Energizer Rechargeable Batteries and Chargers: Frequently Asked Questions Archived 9 February 2009 at the Wayback Machine. Energizer. Retrieved 3 February 2009. ^ battery myths vs battery facts – free information to help you learn the difference. Retrieved 10 August 2007. ^ Filip M. Gieszczykiewicz. "Sci.Electronics FAQ: More Battery Info". repairfaq.org. ^ Rich, Vincent (1994). The International Lead Trade. Cambridge: Woodhead. 129. ^ Deep Cycle Battery FAQ. Northern Arizona Wind & Sun. Retrieved 3 February 2009. ^ Car and Deep Cycle Battery FAQ. Rainbow Power Company. Retrieved 3 February 2009. ^ Deep cycle battery guide. Energy Matters. Retrieved 3 February 2009. ^ Ask Yahoo: Does putting batteries in the freezer make them last longer? Archived 27 April 2006 at the Wayback Machine. Retrieved 7 March 2007. ^ Schweber, Bill (August 4, 2015). "Lithium Batteries: The Pros and Cons". GlobalSpec. GlobalSpec. Retrieved March 15, 2017. ^ Fowler, Suzanne (21 September 2016). "Samsung's Recall – The Problem with Lithium Ion Batteries". The New York Times. New York. Retrieved 15 March 2016. ^ Hislop, Martin (1 March 2017). "Solid-state EV battery breakthrough from Li-ion battery inventor John Goodenough". North American Energy News. The American Energy News. Retrieved 15 March 2017. ^ "battery hazards". YouTube. Retrieved 20 September 2018. ^ Batteries – Product Stewardship Archived 29 September 2006 at the Wayback Machine. EPA. Retrieved 11 September 2007. ^ "San Francisco Supervisor Takes Aim at Toxic Battery Waste". Environmental News Network (11 July 2001). ^ Disposal of spent batteries and accumulators. European Union. Retrieved 27 July 2009. ^ Product Safety DataSheet – Energizer (p. 2). Retrieved 9 September 2007. ^ "Swallowed a Button Battery? | Battery in the Nose or Ear?". Poison.org. 3 March 2010. Archived from the original on 16 August 2013. Retrieved 26 July 2013. ^ "Disk Battery Ingestion: Background, Pathophysiology, Epidemiology". 2016-06-09 – via eMedicine. ^ "Lithium Iron Disulfide Handbook and Application Manual" (PDF). energizer.com. Retrieved 20 September 2018. ^ Excludes the mass of the air oxidizer. ^ "Lithium-Ion Battery Inventor Introduces New Technology for Fast-Charging, Noncombustible Batteries". University of Texas at Austin. University of Texas. 28 February 2017. Retrieved 15 March 2017. ...first all-solid-state battery cells that could lead to safer, faster-charging, longer-lasting rechargeable batteries for handheld mobile devices, electric cars and stationary energy storage. ^ Hislop, Martin (1 March 2017). "Solid-state EV battery breakthrough from Li-ion battery inventor John Goodenough". North American Energy News. The American Energy News. Retrieved 15 March 2017. But even John Goodenough’s work doesn’t change my forecast that EVs will take at least 50 years to reach 70 to 80 percent of the global vehicle market. ^ ZOOM activities: phenom Potato Battery. Accessed 10 April 2007. ^ Two-Potato Clock – Science Kit and Boreal Laboratories[permanent dead link]. Accessed 10 April 2007. ^ "Home made lead acid batteries". Windpower.org.za. 16 September 2007. Retrieved 26 July 2013. Dingrando, Laurel; et al. (2007). Chemistry: Matter and Change. New York: Glencoe/McGraw-Hill. ISBN 978-0-07-877237-5. Ch. 21 (pp. 662–695) is on electrochemistry. Fink, Donald G.; H. Wayne Beaty (1978). Standard Handbook for Electrical Engineers, Eleventh Edition. New York: McGraw-Hill. ISBN 978-0-07-020974-9. Knight, Randall D. (2004). Physics for Scientists and Engineers: A Strategic Approach. San Francisco: Pearson Education. ISBN 978-0-8053-8960-9. Chs. 28–31 (pp. 879–995) contain information on electric potential. Linden, David; Thomas B. Reddy (2001). Handbook of Batteries. New York: McGraw-Hill. ISBN 978-0-07-135978-8. Saslow, Wayne M. (2002). Electricity, Magnetism, and Light. Toronto: Thomson Learning. ISBN 978-0-12-619455-5. Chs. 8–9 (pp. 336–418) have more information on batteries. 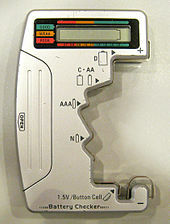 Wikimedia Commons has media related to Battery. The Physics arXiv Blog (17 August 2013). "First Atomic Level Simulation of a Whole Battery | MIT Technology Review". Technologyreview.com. Retrieved 21 August 2013.